Excited by any of the new offerings? The Leupold freedom red dot and the Mossberg pistol look like good enough deals to take a chance on. Also, PIGHUNTER: Anything to report on your suppressors? Makes, models? Do you have enough hearing left to make you glad you got them? What sight do you run on your Ruger mk3? 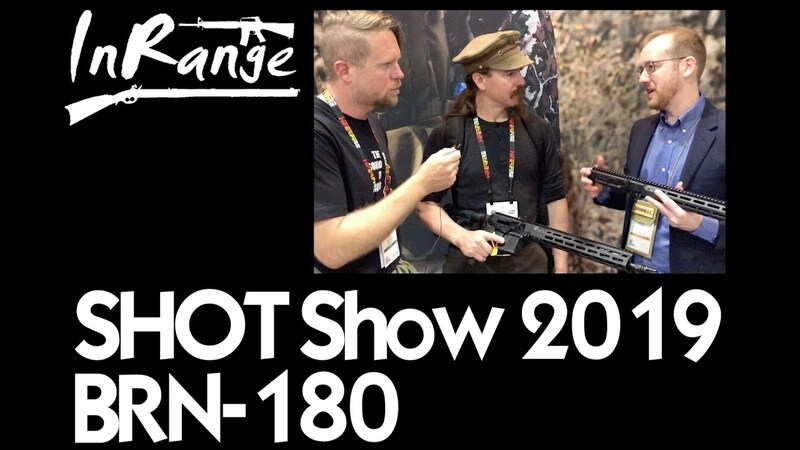 Thus far Brownells BRN-180 is the most intriguing to me. Hey Dewman, both of my suppressors were made by Dead Air. The .30 caliber is their Sandman-TI and the rimfire is their Mask. I'm very pleased with the sound suppression of both. So far, most of my deer hunting this season has been with a suppressor attached to AR's in .300 BLK or the Ruger American Predator in 6.5 Creedmoor. The Sandman-TI adds noticable weight and length to the Ruger 6.5 CM bolt action. I was not please with that while slipping through the thickets a couple of weeks ago looking for pigs. In contrast, the suppressor on the AR's is not cumbersome because of their shorter barrels. To my consternation, the subsonic 300 BLK 190 grain didn't drop a doe I foolishly shot in the shoulder. The deer lives and my cameras have recorded it limping around. I hope to take her before the season ends. But I'll limit any future subsonic shots to head or neck. Most of my hunting with the 300 BLK has been with the 110 gr Barnes TAC-TX, loaded supersonic. It's supposed to have excellent performance on deer. The suppressor really makes it comfortable to shoot without hearing protection. It seems muzzle blast is also very reduced. My MK3 has an inexpensive reflex sight I got from Amazon. So far so good but I haven't used it much. The suppressor works well without being too awkward. But the slower rounds require manual operations of the action. I've yet to mount a scope on the Ruger American rimfire but will do so for squirrel hunting in February. With suppressor and subsonic ammo, it seems to sound like an air rifle. Thanks for your answers guys, much insight. I know F&S gets a lot more play, maybe we're heading toward a magazine merger(? ), but often the answers over there are off on wild tangents. When I ask a question, I'm simply looking for information and experience. Though I don't have trouble with opinions, heck I have them myself. I'm with you. But don't know what it will take to make this portion of the OL site viable again. Gary the bear czar was giving it a boost, but he seems to have dropped out with the changeover to the new format. Gary is not the only one missing since the changeover. Sometimes in the attempt to ‘improve’ casualties can be the result. I am still not convinced that a ‘fix’ was needed, nor that it has been as well received as originally thought ! New is not always better. Agreed. But some people resist change of any kind. I say just embrace it and make the most of it. I partially think Mr. G's absence is due to there is no longer a N.J. bear season, hence no need for "bear czar" reports as well as it's January and living in the northeast not a lot to do midwinter. Also, the Eagles aren't going back to the Super Bowl. There of course may be other reasons and this is all conjecture. Only he can come forth and type the facts. I do know one thing. I hear more lonesome coyotes howling when I come here than I do out my own backyard. On the plus side, the responses are often clearer and more direct. Much fewer instances of "what the heck was that all about" type of comments. PIGHUNTER: Checked out your websites. I don't have the guts to go that low on a reflex sight. Hope it pans out. Definitely see the quality in your supressors. It's funny but I'm the opposite of you. Think supressors are wildly overpriced but am willing to spend premium on a reflex. If we were a couple of the regulars on F&S we'd probably degenerate into personal insults over it. I just now was able to get on here. Since the changeover, this site was not allowing me to use my FS login, nor allowing me to simply select a new but similar username and password. I contacted the web administrator and she or he got back to me once, to ask what email addresses I'd used in the past, and I never heard anything from them after that. I tried to circumvent the whole thing by creating an all-new identity, including email address (though I intended to say who I was once I got on here), and then I accidentally clicked "2019" for my date of my birth. Yep, the site now thought I was an infant, and thus under the minimum age of 13. All further attempts were met immediately with "Go away, you're not old enough!" or whatever the wording. I pretty much gave it up, but figured I'd try again tonight. Not that I'll make much difference. Lol! I have a rep with family and friends for being too cheap. But in all fairness, the MK3 is just used for fun plinking so spending a lot on sights isn't warranted. So far I've limited personal insults mostly to a few old coots who insulted me first. It's been fun messing with them from time to time.